Love the happiness in this photo! And why wouldn’t this bride and groom be joyous? They just had their destination wedding in Cabo and now they are enjoying a boat ride on the ocean - wind in their hair, salt water splashing, the sounds of the sea lions and seagulls! 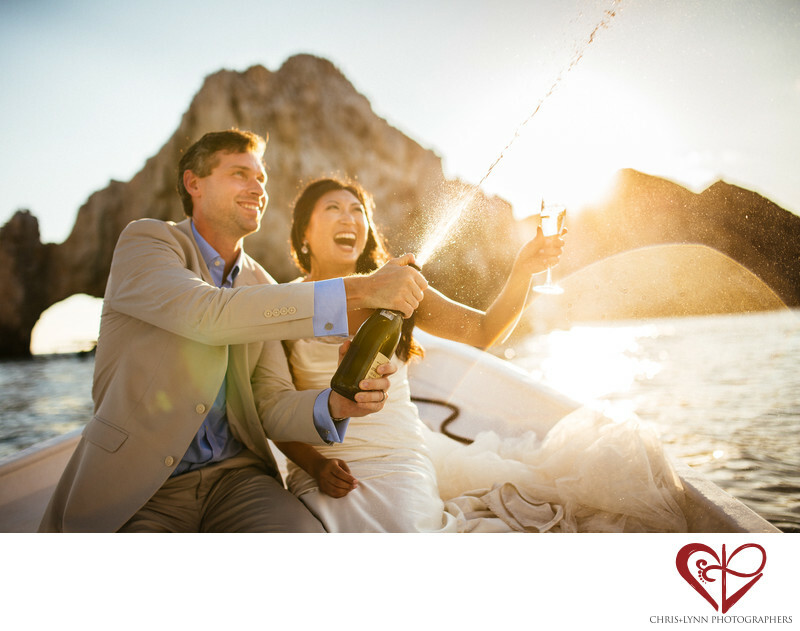 As the sun set they celebrated their love with the pop of champagne as our captain brought us over to El Arco. Cabo’s arch is a distinctive landmark. Also known as El Arco and Land’s End, the unique rock formation is located at the southern tip of the Baja Peninsula and connects to two beaches: Lover’s Beach facing the Sea of Cortez and Divorce Beach on the opposite side on the wild Pacific Ocean. Stunning in its natural beauty, the Arch and its two beaches are a popular place for boat tours. And it’s such a romantic trip for a bride and groom to do photos! Yes, the ride can be bumpy, but it’s totally worth it to create these memories and capture them forever with photography. This afternoon portrait session with our bride and groom was a relaxed & fun session the day after the couple's Cabo wedding at Pueblo Bonito Sunset Resort. Location: El Arco, Cabo San Lucas, BCS, Mexico. 1/3200; f/1.6; ISO 100; 35.0 mm.